NASA Today released this composite image by the Hubble Space Telescope and The Chandra Infrared Observatory that shows tho interacting galaxies. 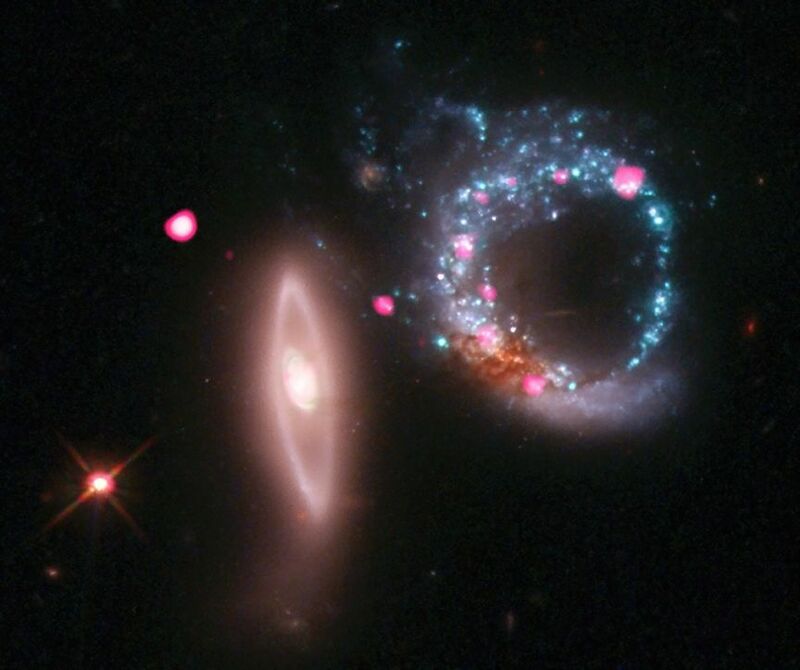 According to NASA, the remnant of a spiral galaxy on the right collided with the elliptical galaxy on the left leaving an expanding wave of star formation on the right, producing large young stars that live a relatively short life before exploding into supernovas and leaving behind neutron stars and black holes. This is about 430 million light years from Earth. The red, green and blue is optical data from the Hubble telescope and the pink is from the Chandra x-ray observatory. Additional data can be found at the Chandra site on the NASA web site with much more amazing information about this fabulous act of creation in God’s universe.